So once the plane landed, the rental car was received, and the GPS system decided to NOT divert me off into San Rafael (Garmin!) I arrived at Infineon Raceway and found that it is pretty much a WHOLE lot of up and down. No really. If you haven't been here the TV doesn't do it justice. Just like TV can't really help you grasp the vastness of Indianapolis Motor Speedway, the elevation changes of Infineon look fractional compared to their reality. Like Turn 3 seems like it's a hundred feet above Turn 11. Remember this in case you're nodding off on Sunday and wondering why there's so little passing. 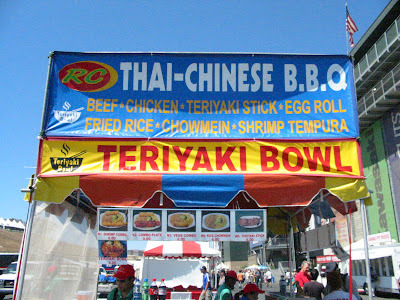 And if an Indy 500 fan was looking for a Pork Tenderloin, well, good luck. A few things need to be said before I start name-dropping. You humble correspondent showed up at the track late (Garmins!) and pretty much was unable to locate anyone who might have had even a remote clue who I was. So of course I went straight to the source - Jack Arute. Jack was milling about on pit row, and was kind enough to exchange pleasantries. Unfortunately he had no props like eggs or cheese graters on his person, which is a bit like David Copperfield without The Great Wall of China. He seemed to meander off into "investigation mode" from there, and went from pit to pit either speaking or hugging. Seriously, Arute is a serial hugger. Next I tracked down Curt Cavin, who may not realize he is so huge in the IndyCar world. Cavin is totally talking to me about how his updates are so much easier now that he has a blog, and all the while EVERY FREAKING DRIVER stops by to say "Hi". Danica even gives him an arm squeeze. I tell ya, they are bowing to the real power. Here's Cavin trying to get the scoop on "aggressive driving" fines. In sticking with media types, I spoke with none other than Marty Reid and Scott Goodyear. In fact, I they appeared to be inseparable. Marty was very talkative about the weather, the food, whatever, while Scott was DEEPLY focused on the Timing & Scoring. SUNDAY SPOILER: Scott seems impressed with AGR teams. 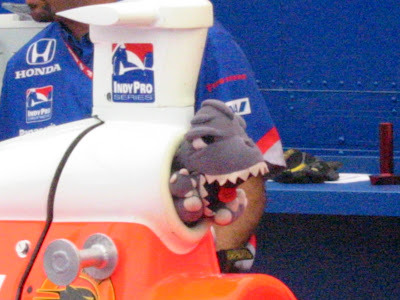 I ventured over to the tech inspection station, and as you can see Hideki Mutoh's team has really taken the "Godzilla" nickname they stuck him with. Later I caught up with our buddy Mike Potekhen, who says the Apex team will be around next year and plans to take it up a notch by adding more cars (for configuration purposes, not more drivers) to their stable. Mike had a wonderful qualification for tomorrow's race, finishing with the fourth best time behind pole-sitter Richard Antinucci, who despite sharing many vowels with me looks nothing like me. 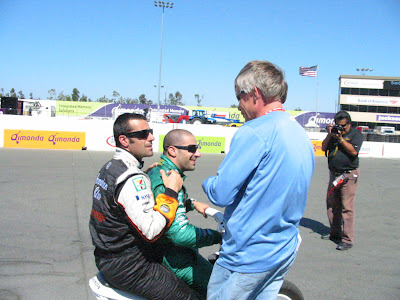 In fact, he looks a lot like Eddie Cheever's buddy Max Papis. Curious. 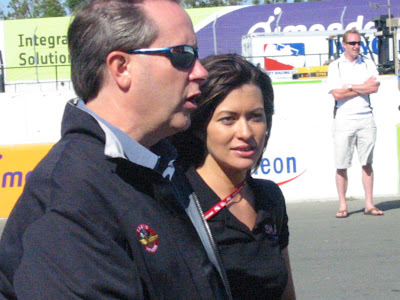 Lastly, I noticed Leilani Munter talking with Mike King. Not sure of which of the two to speak with I waited a while and later caught up with the Tree Hugger. (What, you thought I was tracking down The Voice?) Folks, it's true: she is really, really nice. Like to the point she doesn't seem like a race car driver. The only clue was when I asked her what it was like to go 190 MPH at Kentucky and she said "It was GREAT! I loved it!" Well, OK then. Right now Cavin is writing in his blog, "I met Jeff of MyNameIsIRL.com. Total player. Probably have my job inside two months ..."
Wow, what a great day! It sounds like you're having a great time. And I'm jealous that you got to meet Goodyear.